Mark Massirio runs his auto body shop like his father, grandfather and great-grandfather before him. The business owner makes a living painting and repairing vehicles in Middletown. "We have a good reputation here," Massirio said. But if you see the review of Connecticut Collision Center on Yelp.com, you may not be getting the full picture. The review, as of late March, shows two out of five stars. It's based on one negative complaint about Massirio's business. Massirio said the positive reviews about his business posted on Yelp wind up in the website's filter and do not contribute to his rating. A business owner in Middletown is concerned that an online review website refuses to highlight his shops positive reviews. "If the review is positive, for most part they're filtered out within a couple of days and your star rating goes back to that negative review that was listed a year ago," Massirio said. Massirio estimates his rating on Yelp has cost him hundreds of thousands of dollars in potential sales in the past year, based on a drop in sales since the review was posted. He said the Yelp review is the first thing that pops up on a computer screen when potential customers search for his business. However, Yelp stands by its filter. "We've had from the very beginning a system designed to protect consumers and businesses alike from fake reviews. It's an algorithm. It's computer-generated. It's automatic and it takes into account all of the patterns of data and signals we know about reviewers to help us to determine which content is the most helpful and what we can show," said Vince Sollito, who head's Yelp's corporate communications and public policy. Yelp would not explain how exactly it's filter works, but a website spokesperson said soliciting reviews is not a good thing. Massirio told us he asked several of his customers to share their thoughts about his auto body shop on Yelp. "If they were satisfied with the work I did on their vehicle, they have the right to rave about it," Massirio said. He's not the only business owner in Connecticut with concerns about the online review website. Mike Molnar owns a used car dealership in Plainville. He said Yelp does not provide accurate feedback regarding the true feelings of customers. "I feel like I have to push customers (to submit reviews) to try to level the playing field," Molnar said. "I should be getting reviews based on what consumers feel." The Federal Trade Commission released its database of Yelp complaints to the online reporter research website, Muckrock.com, who shared the database with NBC Connecticut. Nearly 700 complaints are listed in the FTC database. Among the complainants are business owners who claim that it is difficult resolving disputes with Yelp. Business owners have filed a class action lawsuit against Yelp, claiming their good reviews disappeared after they declined to advertise on Yelp. The lawsuit was dismissed, but is currently being appealed. "The claims were found to be baseless and based on unbelievable truths," Sollito said. "You can go onto our site and look at any business page and you'll find advertisers with many negative reviews, advertisers with positive reviews. The filter is designed to protect consumers and let them do their work." A Yelp spokesperson said the negative review against Connecticut Collision Center will not be taken down anytime soon because it does not violate any terms. The spokesperson said Massirio should continue to offer good customer service because the more reviews he receives the better chance his overall score will change. But that is something Massirio said he strives for every day at his business. 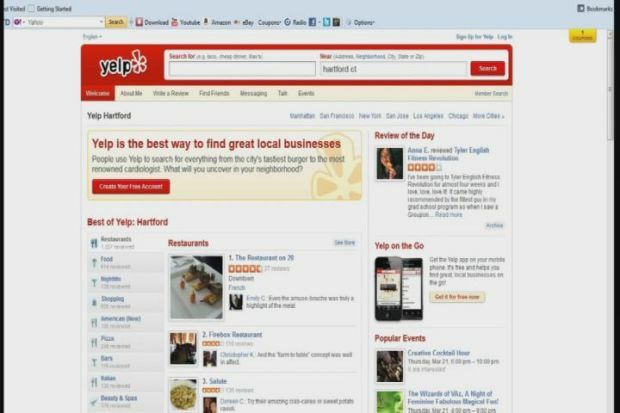 Yelp also said it offers tools to help business owners, including Yelp logos for business cards. But some may ask if that is the same concept as soliciting reviews. Massirio has filed complaints with the Connecticut Attorney General and the Department of Consumer Protection.